The Blessed Individual is the first ESPN Next cover athlete to be revealed via ABC's SuperSign. Giant Cam Newton returned to Times Square yesterday. 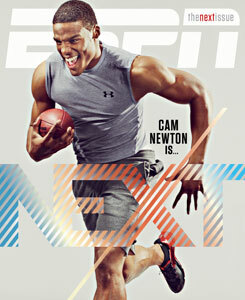 Photos of the Blessed Individual’s photo shoot for ESPN The Magazine’s NEXT issue were splashed across ABC’s SuperSign, the display serving as an announcement that Newton made the cover of the perennial This Person Is About To Change The Game concept issue. It was the first time the issue’s cover athlete has been revealed in such larger-than-life fashion. The enormity of Cam’s glory requires nothing less. The NEXT issue hits shelves in January, but you can read the story, which includes Cam’s thought’s on “collard greens, the sad state of his wardrobe, Batman, the proper marshmallow-to-milk ratio for Lucky Charms and, finally, Drake’s new album,” here. You can also watch a video of Cam being Cam—smiling, laughing, freestyling AKA nicknames for himself, and defending his Superman shirt rip pose trademark—during the photo shoot. 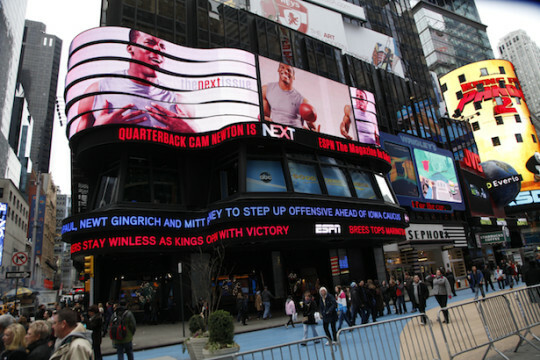 Over the summer, the Blessed Individual was featured on a UnderArmour billboard in Times Square. I am currently in NYC with my family and saw the giant Cam on the billboard at ABC. It was Awesome! We were eating lunch and looked out the window to see our hero “Cam” looking right back at us. We were thrilled! War Damn Eagle! *sighs* A good guy, a good player, and ‘purty’ too.